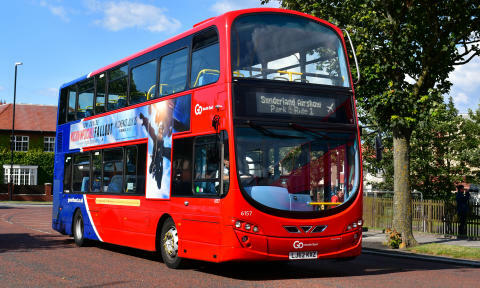 Over 15,000 visitors hopped on-board the bus to battle the wind and rain for a weekend of sky displays at the Sunderland Airshow; with Go North East on-hand to guide passengers to the festivities. The region’s largest bus company supported the three-day event with almost 100 extra buses, 61 drivers and 14 supervisors; working across additional routes and four specially dedicated park and ride services. Travellers to the Airshow were able to park up and hop on-board a bus from either Downhill Sports Complex, Fulwell Quarry, the Stadium of Light or Deptford Terrace with buses running every few minutes to Recreation Park at Seaburn. There were also extra buses running on the A1 Express journey from the Park Lane Interchange to the Airshow, and the A2 Express from Washington. In total, 15,632 passengers chose to take the bus to catch a glimpse of the aerial action, with over a fifth taking advantage of Go North East’s new contactless on-board ticket machines. 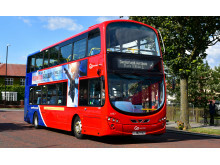 This follows a £1.6 million cash injection by the bus operator to make paying for a ticket as fast and easy as possible for travellers. The Sunderland Airshow was held from Friday 27th to Sunday 29th July across the city’s seafront. This year’s event celebrated its 30th anniversary and included colourful displays from the Red Arrows, the Typhoons and Spitfires.